I’m talking on the phone and I hear this buzzing like the biggest bumblebee you’ve ever heard, and them some. 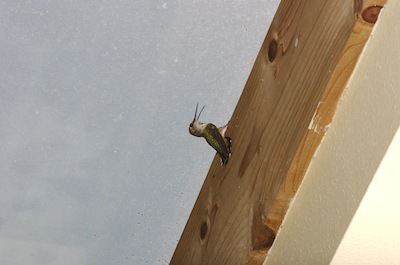 But I know it’s not a bee, and pretty soon, I’m going to be fishing a hummingbird out of my skylight. He’s pretty unhappy about this glass ceiling thing. It’s not hard to catch them, once they’ve settled down a bit and I’ve gotten up on the desk. A little matter of grabbing it in cupped hands and walking it outside. Then watching as the little guy shoots up 45′ into a tree where he started chittering at me.